Fiddler US né le 10 Avril 1898 à Humphreys County (Tennessee). 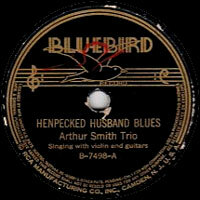 Fiddlin' Arthur Smith fit ses débuts en 1930 pour le label Bluebird Records en tant que membre des Dixieliners en compagnie de Sam et Kirk McGee. Vedette du Grand Ole Opry de Nashville (Tennessee), Il joua avec les Delmore Brothers, apparaissant en outre dans plusieurs Westerns dans les années cinquante. Fiddlin' Arthur Smith est décédé le 28 Février 1971. There are many, many people named Arthur Smith in the world. There are at least two famous Arthur Smiths in country music, and each of them seem to have decided to use their instrument to identify themselves. So besides Fiddlin' Arthur Smith there is also Arthur "Guitar Boogie" Smith. And if one really wants to get Smith-happy, there is also a famous banjo builder, Arthur E. Smith. But let's say one was hanging out in the corner of Tennessee formed by the Cumberland and Tennessee rivers. In that case, there would be one and only one Arthur Smith of any note, and that would be the one who fiddled. He was called the "king of the fiddlers" in this neck of the woods, and literally all one has to do is go for a drive to be reminded of it. 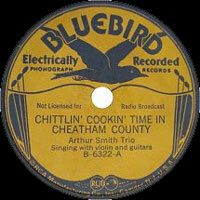 One can hum "Chittlin' Cookin' Time in Cheatham County" while driving through Cheatham County; likewise Smith has documented "Dickson County Blues," "Indian Creek," "Sugar Tree Stomp." Oh, and Smith's "Paris Waltz" was hardly written while he chomped on a baguette. That's Paris, TN, the little town across the river. Smith is the giant of fiddle in the Tennessee valley, certainly one of the most influential fiddlers from the old-time school whose tunes, approach, and innovation continued to be copied by progressive bluegrass players decades later. He played professionally for nearly a half of a century, with only a few lulls in his career. Smith was born on a family farm and had no formal education beyond fifth grade. As was common in this time in the Tennessee hills he married quite young, just after the outbreak of World War I. Smith was 16, his bride Nettie was only 15. Already music was a big part of his life, although researchers have been unable to pinpoint exactly when he started playing. As a youngster he was already a fiddler, and good enough to work in some local bands, mostly playing dances. His wife played guitar in one of these groups. Nettie Smith recalled selling chickens to buy her husband a fiddle. The original price of this instrument was six dollars and 50 cents, and decades later it would be worth at least 100 times that much. The neighbor who sold this instrument was the appropriately named fiddler Grady Stringer, who would have to have been the first main influence on Smith as a musician. 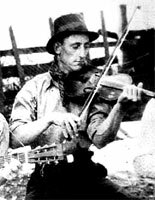 Another early influence was the fiddler Walter Warden, whose tunes are still part of the old-time repertoire. Smith continued performing in the area, working with his wife, his cousin Homer Smith, and a fiddler named Floyd Ethredge who went on to work with the early Grand Ole Opry stars the Crook Brothers. In 1921 Smith moved to Dickson and began a railroad career, first as a logger and then later a linesman. The job involved travel back and forth across the state. Smith would pack his fiddle and pick up music from people he met along the way. One of these musicians that recalls Smith from this time was Jack Jackson, the first country artist to record in Nashville. This era was the very beginning of that city's life as the world's country & western music capital. The radio station WDAD at first wouldn't touch country music, finding it undignified. That was until a fellow named George D. Hay was hired as station manager, and the wealthy Henry Ford decided to promote fiddle contests to "preserve authentic American values." This is where Smith could step in, as he was already winning fiddle contests across Tennessee. Smith's first appearance on the Opry was on December 23, 1927, for a 30-minute solo fiddle set. At this stage of his career he was not singing, but just played unaccompanied fiddle in the style of so many rural players. His cousin Homer re-joined Smith after several weeks on the Opry. The two of them wound up appearing on the show 28 times that year, more than any other act except the harmonica player DeFord Bailey. Nonetheless, he carried on with the railroad job, as nobody could have survived on the Opry wages of five dollars per man per show, regardless of how much farther a buck might have gone back then. But the travel in and out of Nashville definitely had an effect on Smith's ability to be in the right place at the right time to score a recording date with companies that were actively documenting the work of fiddlers, many of whom were much less popular than Smith. Smith and his cousin split up their relationship in the early '30s, and a new band called the Dixieliners was formed with the very talented brothers Kirk and Sam McGee. In many ways this was one of the first supergroups, putting together three virtuoso string players. The three players all had a great deal of repertoire in common, all were in their mid-'30s, ambitious, determined, and energetic. It was, in short, a great match. It was in this combination that Smith began singing, an event about which Kirk McGee recalled, "Once he finally got to singing, and then we couldn't stop him." For the most part the group divided up chores thusly: Smith did the fiddling, Sam did the comedy, and Kirk and Sam did the vocals. A pianist was added to the group in due course, and Smith looked no farther than his daughter Lavonne Smith, who began to tour with the Dixieliners while still a high school student, picking up her five-dollar pay at the Opry like the rest of the country greats. Fans of dissonant country music have spent lifetimes searching for a tape of an early broadcast by this band in which Lavonne was so startled by a steam whistle being blown on stage that she pounded out a harsh chord in the style of avant-jazz pianist Cecil Taylor. This didn't make Smith very happy. "It was a goof, and Daddy didn't like goofs," she said. The Dixieliners became more and more professional through the Opry, the sponsorship of a glue company, and the hiring of an all-purpose booker, manager, and advance man. The group toured through the region, playing in many small communities. Sometimes they would be part of a larger Grand Ole Opry package tour that would feature performers such as Uncle Dave Macon. Some of these tours also involved the famous Delmore Brothers. 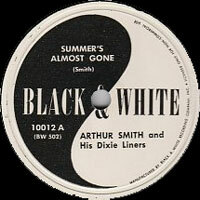 Smith was working with both groups in various combinations through about 1934, then began working with the Delmores exclusively, and it was with this combination that he finally began recording a series of sides for the Gennet label. The first sessions were done in New Orleans, and it included two tunes that came to be known as Smith classics, "Blackberry Blossom" and "Red Apple Rag." On sessions for Victor the next year, Smith once again opened his mouth and recorded some vocal numbers, and according to Alton Delmore it was a matter of economics, not choice as the record label felt instrumental music wasn't going to sell. The first Smith vocal hit went on to become another standard repertoire number, as do so many country tunes that have such a basic philosophy included right in the title: "There's More Pretty Girls Than One." 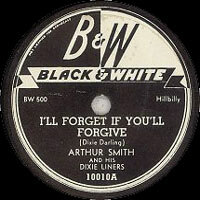 More than five sessions were cut with the Delmores in the next few years, the tracks coming out under the name of the Arthur Smith Trio rather than the Dixieliners, although later album reissues on County reverted back to the Dixieliners name. Listeners of the time would have no idea whether a new record was a Smith feature or a Delmore Brothers cut, so completely had their styles meshed. Corrupt business practices also added to the confusion, as the guys would sometimes cut a song for one label under Smith's name, then redo it for a competing label as the Delmore Brothers. More than 50 different songs were cut during this period, the most famous of the batch being Smith's song "Beautiful Brown Eyes," which would later lead to court action when the artists behind a cover version decided the song was in the public domain. Fiddle contests continued to be popular in these years, with promoters presenting bigger and bigger showdowns between fiddlers such as Curly Fox, Clark Kessenger, Clayton McMichen, and the native American fiddler Natchee the Indian. These players were all so hot it was often impossible to choose a winner, unless one of them happened to have organized the contest in which case he would sometimes present the first-place prize to himself. The railroad job was taking a back seat to touring, and sometimes the music on tour was taking a back seat to hard drinking. Smith fell in with a bunch of rowdies at a 1938 fiddle contest and didn't even show up to square off against a team of fiddlers that included the sponsor, a local sherrif. The lawman was so upset with the Smith no-show he tried to have him arrested. It did lead to an Opry suspension, and as was often the case this momentary vacancy helped someone else get his foot in the door, in this case a little curly-haired singer named Roy Acuff. In the late '30s Smith was hired by the Tennessee Valley Boys, a young band on the rise that needed a well-known, senior statesman on fiddle out front. By 1939 this band included three fiddlers: Smith, the young Howdy Forrester, and Georgia Slim Rutland. In 1940 Smith moved to Shreveport, LA, to join the Shelton Brothers on radio station KWKH. This job didn't keep Smith's interest and after roaming around the Gulf Coast he rejoined Lavonne in Decatur, AL, putting together a local radio band that somehow ended up consisting of players that all had the first name "Arthur," except of course for Lavonne. 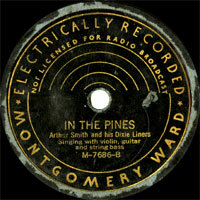 But unsure of how well the Band of Arthurs would fare on a 1940 recording date, Smith instead threw together a collaboration with the young Bill Monroe. This session was in many ways historic. It was the first recording Monroe would do and the last of Smith's Bluebird sessions. In the early 40s, as the world's attention was focused more and more on tragic events in Europe, Smith joined the Bailes Brothers in West Virginia. He had several featured solos with this show, and is credited with helping to popularize the song "Orange Blossom Special" as a feature for fiddlers. In 1943 Smith began emphasizing his singing and songwriting, and published two important songbooks, Songs From the Hills of Tennesse and Arthur Smith's Original Song Folio No. 1. 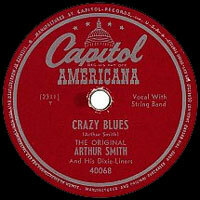 Smith continued working with different groups during the '40s including a duo with his son Ernest Smith and a backup stint with the cowboy singer Rex Griffin. His flair backing up the increasingly popular western style of music led to gigs with Jimmy Wakely, a former backup singer to cowboy star Gene Autry. Smith rode this horse ride into Hollywood, where he wound up appearing with Wakely's band in a series of low-budget Monogram oaters such as Oklahoma Blues. But a cowboy Smith was not, and luckily his bowing arm wasn't injured when one director made the mistake of putting the fiddler on top of a horse without first attaching him to the saddle with a strong adhesive bond. His recording career continued while on the West coast, leading to a contract with Capitol, where he recorded "Orange Blossom Special" "Crazy Blues" and other successful numbers. For the first time he ran abreast of the North Carolina guitar picker with the same name, and the sides were released as The Original Arthur Smith and His Dixieliners to avoid confusion with the Guitar Boogie man. The next decade would be the low point of Smith's career. After backing several country singers including Billy Walker, he wound up in Nashville working as a carpenter rather than as a musician, a development that can be partially blamed on Smith's alcoholism, although its significance as a symbol of that city's cultural backwardness shouldn't be downplayed. In the middle of this low period, Smith had the pleasure of hearing Roy Acuff singing "Beautiful Brown Eyes," no doubt while he was sawing a board on some job. The song became so popular that there were scores of cover versions, but everyone followed Acuff's lead and declared the song "public domain," despite it having appeared in a published Smith song folio in 1943. Smith won the suit but it was settled for a lump sum rather than any actual account of royalties. By the mid-'50s rock & roll was on everyone's mind and it seemed a nadir for old-time music. But by 1956 Smith had been invited back to the west coast by Wakeley, where he struck up a new collaboration with the famous country guitarist Merle Travis. In the meantime a new folk revival had begun with groups such as the New Lost City Ramblers, whose member Mike Seeger was combing the hinterlands looking for authentic old-time musicians to research and document. His efforts led to combining Smith with his old pals the McGee brothers for a 1957 recording session held in Kirk's livingroom. Seeger was originally unsatisfied with the results, released one album, and then held onto the outtakes for nearly eight years, hoping a new session could be arranged. Finally the balance of the material was released. Fans of old-time music find this reunion of old friends, playing casually and with growing excitement at every tune, to be one of the finest recordings ever done in this genre. Another helpful development during this time was the interest in Smith's music coming from the modern bluegrass camp, as Flatt and Scruggs' fiddler Paul Warren began introducing a whole series of features based on Smith's material into the act. More work for the Opry old timers turned up in 1963 with the Starday label inaugurated a series of releases devoted to this music. The Smith album Rare Old Time Fiddle Tunes features fiddle accompanied only by son Ernest on guitar, and is considered another of Smith's masterpieces. Seeger issued invitations for Smith and the McGees to join the new folk circuit including appearances at the Newport Folk Festival in 1965, where they received a thunderous ovation. The mainstream audience attraction for this type of music was shortlived, though, and Smith wound up in his later years travelling on the same old rural circuit that he had started out in, frequently performing for old friends who would go to trouble to record the event because they sensed Smith was on his way out. He made his last appearance in 1969 in Louisville in a group with Sleepy Marlin and Tommy Riggs. He was buried near McEwen, TN, just a few miles from where he had first learned to fiddle a tune. His music remains so strongly remembered, and completely influenced so much of the country fiddling that came after it, that it seems no exaggeration to say that he lives on in a form more like a part of the landscape than the legend of a man.